If you had it all, what would you do? At the age of 20, Daria felt he had everything and nothing. To outside observers, he had it all: a loving family, a beautiful girlfriend, materials riches, and a family business waiting for him to assume leadership, but there was a gnawing feeling that something was missing. When Daria�s friend dies at the age of 21, he is shaken at the roots. Witnessing death for the first time, he questions every aspect of life including the origins of suffering and happiness. He wonders why he is following the herd in a life-consuming race towards emptiness. Hungry for meaning, he leaves everything he�s ever known to expose himself to the reality of the world through his own experience. His journey takes him on an expedition through the countryside of Mongolia where he learns of generosity, surfing the coasts of Bali, experiences the essence of martial arts from Aikido masters and back-country snowboarding in Japan. He ventures through India, learning yoga and meditation, and finds a prominent monk in Nepal who �freezes� him, shifting his understanding of the world around him. With his new found knowledge, he sets out on a 12-day trek to witness the colossal peaks of the Everest region, where his experience is nothing short of the divine. Daria�s path leads him to snakes and stitches, avalanches and wolves, death and rebirth in order to return to society and impart one message: a new-found understanding. Daria makes no claims to be a saint or a revolutionary. He faces the same dilemmas that many of us face on a daily basis and through his mistakes gains a better understanding of who he is and how he wants to live his life. 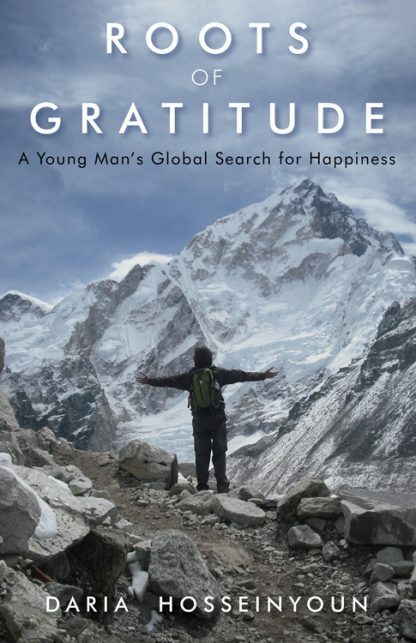 Roots of Gratitude presents an inspirational and captivating journey of a young man�s search for his true self. By sharing his experiences with readers � his struggles between following his dreams and societal expectations, and his magnificent spiritual awakening � he imparts courage to follow our hearts and to experience the world for ourselves, so that we may all find a way to our true (and grateful) selves.